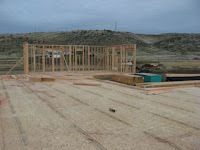 The main floor of our new house is nearly framed in, and they will probably be starting on the second level tomorrow. It's so fun to walk through and imagine where we will put things and how each room will be used. Very exciting. We have to decide on windows today and then on the heating/cooling system. Ryan was over there a few days ago shooting BB guns and then his shotgun on the property, and the neighbor got a little nervous (even though the shot was not going anywhere near his property line.) I think they got things smoothed over. This picture is from a few days ago when they were just starting to frame. I'm so excited for your family and I can't wait to see the finished product!